Pace University is a metropolitan New York university with two campuses. The New York City campus is located in lower Manhattan in the heart of the civic and financial center of New York City. The Westchester campus is located in Pleasantville, New York, 40 minutes from New York City. Type of SCHOOL: Pace University is a private metropolitan university. Since 1906, Pace has produced thinking professionals by providing high-quality education for the professions with a firm base in liberal learning amid the advantages of the New York metropolitan area. Size of campus: Pace University has campuses in New York City and Westchester County. Our New York City campus is in the heart of the civic and financial center of New York. Our Westchester campus in mid-Westchester County is set on 200 acres of rolling countryside. Number of Faculty: 1,273 faculty members; student-faculty ratio of 14:1; 90% of faculty members hold a PhD or terminal degree. International Student Services: Pace’s International Students and Scholars Office (ISSO) works with students to answer questions about immigration regulations, employment authorizations, health insurance, and other issues. Financial Aid: Merit-based scholarships are available to international students who apply as first-year and transfer undergraduate applicants. In fall 2017, 78% of international undergraduate students received some form of merit-based scholarship money. Use our Merit Scholarship Estimator to see how much merit aid you will receive from Pace at pace.edu/calculator. Test Score Requirements: Students who will or have graduated from high school in a country where English is not the official language and for whom English is not their first language must present proof of English proficiency by submitting scores from the TOEFL (minimum score of 550 paper-based version, 213 computer-based version, or 80 internet-based version), the IELTS (a minimum score of 6.5), or a Pearson PTE (minimum score of 54). SAT or ACT scores are not required for admission but are required for scholarship consideration. The undergraduate application fee is $50. The Early Action I application deadline is November 1, the Early Action II deadline is December 1, and the regular application deadline is February 15. 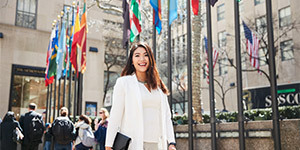 Pace University offers international students a unique combination of strong academics, real-world experiences, and mentorships that will guide you toward becoming successful, professionally and personally. Pace is home to 2,302 international students who choose Paceto gain exceptional professional preparation in New York, receive a top-notch American education, and immersethemselves in US culture. With more than 100 majors andaccelerated bachelor’s/graduate degree programs, Pace offers everything from Biochemistry and Business to Computer Science, Psychology, and Teaching. Our small class sizes—20 students on average—allow personal attention from faculty who support student success. We are committed to providing you with multiple opportunities to practice what you learn with internships, faculty-sponsored research, academic and professional competitions, school-sponsored projects with outside firms, and community-based projects. At Pace, you can build an impressive résumé before you graduate. We offer two campus locations—in the heart of New York City and in nearby Westchester County. Our New York City campus is your home base for living, studying, and working in the most dynamic city in the United States. The city is your campus, with cultural and professional activities, learning opportunities, and internships at places like the Federal Reserve, Microsoft, Lincoln Center, the New York Stock Exchange, and many more. At our newly renovated Westchester campus in Pleasantville (just 34 miles from Manhattan), you can enjoy two sides of New York: the quintessential college campus lifestyle and easy access to all the professional activities and entertainment the New York metropolitan area offers. You can intern at world-class companies in the city and those located closer to campus. Our Career Services team offers you one of the largest internship placement programs of any university in the New York metropolitan area. Eachyear, Pace students complete more than7,000 internships, co-ops, practicums, and field work experiences. Wetake career preparation seriously, whichis why 84% of international students received internships during the last academic year and 84% of Pace’s international graduates were employed full time within one year of graduation. Pace’s International Students and Scholars Office (ISSO) helps students navigate studying in the United States and answers questions about immigration regulations, employment authorizations, health insurance, financial aid, and other issues. A Pace education extends beyond the walls of the classroom with a variety of cultural events available on and around both campuses and more than 100 clubs and organizations for you to get involved in—all of which give you the opportunityto grow as an individual. Merit-based scholarships are available to international students who apply as first-year and transfer applicants. In fall 2017, 78% of international undergraduate students received some form of merit-based scholarship money.